During the ‘40s, suits were still everyday wear for men, whether they were going to an office job, to church or out to dinner. They were also probably the hardest hit piece of a man’s wardrobe. It didn’t matter if he were relaxing at home after a hard week at work, the 1940s men’s suit was the first item pulled out of the closet each morning and the last to put away. They were usually made from wool, worsted wool or tweed, but during the war synthetic rayon blended with wool was usually used instead. The thickness of suit fabrics was much heavier than today’s suits. Colors were muted – black, navy, grey, dark brown, tan and medium blue were all standard. During the summer fabric was more lightweight as were the colors. The most popular colors during the ‘40s were a medium grey, brown, medium blue and tan in the warmer months. Tweed, herringbone, check, and overplaids were also very popular suiting patterns. Wide chalk stripes were the most classic ‘40s suit pattern, and pinstripes became popular later in the decade. Almost every suit had stripes or a pattern to it. Of course, not all men were fortunate enough to be at home during the ‘40s. Following Japan’s bombing of Pearl Harbor, the United States officially entered World War II on December 8, 1941. Brave men dutifully joined the US armed forces and swapped their civilian clothes for a military uniform. As so much wool was needed to manufacture these uniforms, as well as silk for making parachutes and maps, civilian resources were under immense strain. To cope with this, in March 1942, the US war production board issued regulation L-85, which put strict limitations on clothing and the use of natural fibers. As part of these regulations, a new style of 1940s men’s suit emerged – the Victory suit was born. Rather than being an all-wool suit, the 1940s men’s Victory suit was mixed with synthetic fibers such as rayon (derived from wood pulp) to reduce the amount of natural material used. The jacket was shorter, and pants often had no pleats or cuffs and were narrower. Suits were not sold with an additional pair of pants, which was a usual pre-war practice. There was even a strict limit on zippers or buttons, which weren’t used unless absolutely necessary. Both single-breasted and double-breasted suits were popular. The double-breasted suit aided in the wide fit associated with the 1940s. The single-breasted suit was slimmer but still had very wide notch lapels. The double-breasted usually had peak lapels. 1941 Men’s Pinstripe Suits in Teal Blue, Sand, Tan or Medium Green. Before the war and somewhat after, men wore a matching vest (waistcoat) with their suits. Besides matching the suit, vests were V-neck cut with pockets on either side, one of which could hold the watch and chain that commonly dangled from the vest. They were considered a wasteful item in war time and after, most men preferred not wearing a vest with their suits at all. It was cooler and more comfortable without them. The suit trousers were usually flat-fronted with a pressed crease down the center. More youthful trouser styles featured double pleats. They were worn at the high waist (at or above naval) with a 3-inch waist band. Belt loops were placed in the center of the waistband or a little below the top for more casual styles. Trouser legs could be no more than 19 inches wide around the ankle, which is actually very wide compared to today’s “skinny” suits. The pant fits wide at the leg, draping around the hip and down to a slightly narrower cuff. Usually men’s trousers were straight hemmed at the bottom as required during the war; however, men preferred having 2-inch trouser cuffs (turnups) so they purchased pants longer than they needed and cuffed them at home– a tricky way of getting around the law. In France, a 1.75 inch strip of material was allowed to make a faux cuff but it was so small it was hardly noticeable. Trousers were worn long enough to cover the tops of shoes, but not so long that they bagged up at the bottom. The American clothing catalog Sears and Roebuck of 1944 included this note about men’s trouser cuffs: In accordance with Government Regulations trouser cuffs can be furnished on your trousers if you are average or below average in height and your other measurements are in proportion. Otherwise, plain bottoms will be furnished. For most men, cuffed pants were still a viable option, unless they were tall. Over in Britain, men faced even stricter rules and were limited in the number of clothes they could buy, using a coupon system. After the war, soldiers in Britain were given ‘demob’ (demobilization) suits to wear. They were very plain and of poor quality, usually made in a late ‘30s style. But at least they weren’t a uniform! After rationing ended, double-breasted jackets with wider lapels came back in style and were worn more frequently during the ‘50s. The influence of this wider, looser, bolder suit style came from the forbidden Zoot Suit. 1940s suit and sport coat fabrics in detail: pinstripes, light plaid or windowpane, chevron and small checks were popular. Although the Victory suit was created out of necessity rather than the natural evolution of fashion, wearing it allowed men to feel that they were being patriotic and helping the troops by giving up limited and much-needed resources. In order for patriotic men to show their support for the war, they would also often choose to wear their pre-war 1930s suits, so there was a real miss-match of older ‘30s styles with newer items produced under the close scrutiny of the L-85 regulations. In fact, many servicemen returned from World War II to find that the suits they’d left behind had been cut up and re-fashioned into other items, such as children’s clothing and women’s suits. It was important to show that no fabric was wasted during these tough times. Unsurprisingly, as a result of these austere times, 1940s men’s suits and fashion, in general, was slower to develop during the first half of the decade. In stark contrast to the Victory suit, there was an outlandish 1940s men’s suit that was the complete antithesis of the war-produced suits as instructed by the war production board. This was the infamous Zoot suit. Compared to the muted colors of the Victory suit (black, navy and brown), the Zoot suit was available in bright green, yellow and even purple. The Zoot suit actually arose out of the African-American musical sub-culture in early 1930s Harlem. As if you haven’t already realized from the loud color options of this particular garment, the Zoot suit was very exaggerated. The jacket was oversized with wide lapels and shoulder pads, while the pants were extra high-waisted and wide-legged, dramatically narrowing at the ankle. It was soon adopted by young Mexican and Italian-American men, along with gangsters and jazz musicians of the day. During World War II, the Zoot suit was widely viewed as a deeply illicit item of clothing due to the over-abundance of materials used. The restrictions as set out by the war board banned the making of the wide-cut and over-the-top Zoot suit. Most honest and rule-abiding tailors followed the restrictions, but a handful of bootleg tailors in New York and Los Angeles continued to make them. Given the wide condemnation of Zoot suits, military men on shore leave became aggravated at the sight of young men walking around in what they viewed as overly lavish and unpatriotic clothing. Especially when compared to the conservationist Victory suit, which had no excess fabric or embellishments of any kind. Unfortunately, this led to some ugly scenes which remain a blot on the history of this period. These disputes became known as the Zoot Suit Riots. There’s a very interesting documentary about this on . Learn more about the history of Zoot Suits and shop for vintage inspired Zoot Suits. Once the war had been won, America celebrated and welcomed home their heroes. The end of the war also resulted in an end to the clothing restrictions that had been in force. As there was no longer a need to be frugal with materials, this brought about a dramatic change in fashion. Men returning to civilian life weren’t keen to return to pre-war fashions, they yearned for something different. Like the young Zoot suit wearers that wanted to inject a little color into the drab war years, military men were also keen to experiment with color and style. Sensing the public mood for a break from itchy and tight military uniforms, Esquire magazine promoted ‘the Bold Look’. This was seen as the masculine version of Dior’s New Look for ladies. The Bold Look encouraged men to be less conservative in their fashion choices. Characteristics of the Bold Look involved wide borders, big patterns, and strong colors. Jackets were loose fitting with pronounced shoulders and a lower button stance; ties favored the wider Windsor knot and were designed in big checks and wide stripes; shirts were made with a ‘command collar’, which is quite wide-spreading with elaborate stitching running half an inch from the edge; and felt hats featured a snap-brim pulled down at the front, with a dented crown. The Bold Look allowed men that had endured the hardships of war to forgo the Victory suit and return to suits that were bigger and better than ever before. The shoulders were wider than ever, notched and peaked lapels increased in size and there was no limit to the number of buttons or zippers. This Bold Look style became very popular with returning servicemen, from 1947 to 1948, before the fashion fad passed and it was ushered out of style. In an interesting twist, despite being looked down on during the war years, the Bold Look had obviously taken design influence from the colorful and looser fitting Zoot suit. The new suits were available in brighter pinstripe, herringbone and plaid instead of the dull colorways of the Victory suit. 1948 The bold look set the trend in men’s semi-casual fashion with larger prints and color combinations. Rather than matching suits, mixing and matching jackets and trousers became more commonplace. Sports jackets were very popular, in particular the Hollywood jacket which often featured contrasting collars, cuffs, and yokes (a section on the back, around the neck and shoulders). Although vests did make a return, the war years had shown that they were no longer required to be worn with a suit so their popularity didn’t quite recover. 1949 The suits was still wide and baggy but more relaxed than earlier years. This was the key style of the early 1950s. Do you like men’s forties clothing? Keen to go for a 1940s look? Then follow our simple styling tips. 1947 Knox Hat with Swagger! The trilby and fedora were the true hat kings of the era. A homburg hat also became another well-loved option if you wanted to go for something a little different. Wear your hat pulled down or at a jaunty angle and put a skip in your step. Lean about and shop for men’s 1940s hats styles. Have fun with ties – the more flamboyant the better. Vintage 1940s ties can still be widely purchased, so go hunting for silk, rayon or wool options. Ties of this period can be a little shorter as men wore their trousers higher than they do today. It was usual practice for the tie to sit around two inches above the waistband. Hand-painted ties were in high demand, featuring all manner of crazy things from animals to exotic foliage and skyscrapers. Even pin-up girls adorned the tie. If you have a particular hobby, why not try to find a tie that carries this theme? Learn about men’s tie history here. Shop for new ties in classic prints available in the 1940s. 1940s men’s shirts had large pointed collars and were shorter than today’s standards. You can’t really go wrong with a long spearpoint or classic button-down collared shirt. A wide spread collar was popular in the early ot mid years. Don’t be afraid to experiment with colors. Consider narrow stripes or dots on light blue, yellow, white, peach or sage green. Add in solid pink, cream, tan, grey and denim blue to the later years. Shop 1940s style men’s shirts. The fit of men’s dress shirts was quite baggy. Shaping to the torso began in the mid-1940s. They are nowhere close to “slim fitting” shirts we see today. They had a single cuff or french cuffs and usually a breast pocket. Although first introduced in 1917, men didn’t start wearing belts until the 1930s. During the war years, belts were replaced with button on suspenders as the leather was too precious. After the war, belts made a return and actually increased in popularity after being widely worn in the military. Belts also became more popular as pants were more fitted at the waist. Shop men’s suspenders. A pocket square adds a lovely flash of style to a 1940s men’s suit. If you’re aiming for a war time look, I would avoid silk pocket squares as this delicate material was in short supply during this time. Rayon pocket squares are an excellent option. Experiment with folding techniques for a style that you like. were especially common in the 1940s. Wingtips, toe cap Oxfords or spectator shoes were the popular 1940s shoe styles. It’s important to look after them and polish and buff them regularly. A man would never have been seen in grubby shoes no matter the circumstances. Especially a man that has served in the military. 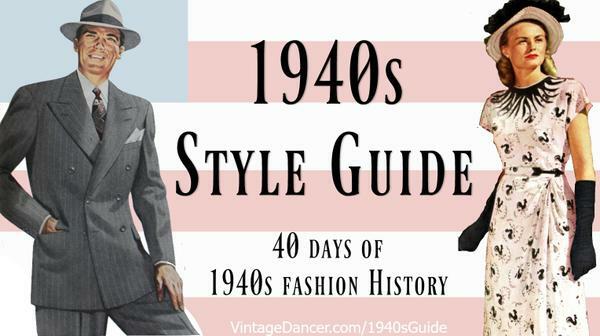 Learn about 1940s men’s shoes styles. If you can’t find a 1940s men’s suit for sale, then perhaps just try a simple two-piece suit in black, navy or brown. Of course, you will need to ensure it has no extra details such as pleats or cuffs. Pair with a plain spearpoint collared shirt and some classic wingtip shoes. Your tie should be subdued in color (nothing too bright, please) and quite narrow in length. You should also wear suspenders rather than a belt. For that extra authentic touch, why not find an honorable These were worn by men during the war so that people could see that there was a good reason why they were home and not fighting for their country. Reproductions of Zoot suits are available for the ultimate 1940s rebellious look (please do resist those cheap options for men’s 1940s fancy dress). Wear with a plaid button-down shirt (perhaps you can find an authentic 1940s men’s shirt), a loud tie, leather shoes that have been polished to a high shine and a wide-brimmed fedora. Have fun with a double-breasted pinstripe suit with wide lapels and a high crown fedora. Wear with a striped shirt and loud, wide hand-painted necktie. A leather belt would be an authentic touch, rather than suspenders, along with cap toe Oxford shoes with two-tone laces to add an extra splash of color. As you can see, it really was a fascinating period with a real contrast in styles for the 1940s men’s suit and men’s forties clothing in general. New suits with a classic wide fit, striped patterns or oversized Zoot style. Sign up below, confirm your email, and receive your first article in just a few minutes.